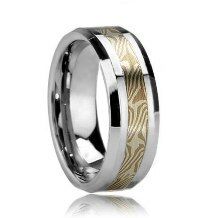 Mokume Gane Tungsten Wedding Bands feature the stunning art of Japanese metal working where two metals are melded together to produce a unique and breath taking pattern. 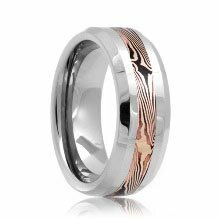 The pattern consists of two different precious metals and is inlaid into Tungsten carbide bands to produce truly distinct Mokume Gane Tungsten Rings. Mokume Gane, or directly translated "Wood Grain Metal" is the term used to describe these truly remarkable patterns in these Mokume Tungsten Rings.